A journey back in time … a snaphot of Festival 2000 Event. The Festivals & Events of the Brunswick Valley reflects the unique history of the area, which is celebrated by locals and visitors together at selected times throughout the year. The Brunswick Valley community welcomes visitors all year round and endeavours to provide enjoyable activities for all members of the family. The Commonwealth Games is being hosted on the Gold Coast in 2018. Less than 1 hour away from the beautiful Brunswick Valley, this event will provide the opportunity for visitors to the games, taking some time out visiting the Brunswick Valley. Custom car and hot-rod enthusiasts converge on Brunswick Heads mid-year (usually in July) to showcase the glitz and glamour of the auto world. This must-see event is always a a crowd-pleaser. The Brunswick SLSC attends a number of carnivals and competitions throughout the year. Please access link above for information relating to Brunswick SLSC competition. An annual art expo is held at the Ocean Shores Public School. Comprising of photographic and artistic exhibits, this display and art competition allows all age groups to showcase their creative talent. A new theme is explored each year, inspiring competitors to unleach their creative flare. The streets and skies of Brunswick Heads come alive with the Kites & Bikes Festival. An enjoyable day out for family and friends! The streets of Brunswick Heads have a great selection of pre-loved treasures. 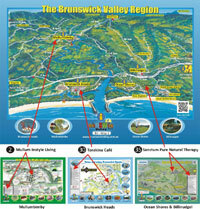 The Brunswick Valley is an ideal setting for sporting groups to conduct their training and fitness camps. The natural layout and features of the valley allows teams and individuals to enjoy their activities in a holiday atmosphere. Join the colourful flotilla and paddle from Mullumbimby to Brunswick Heads down the beautiful Brunswick River. This eco-friendly, family fun event involves paddling your own or hired non-motorised craft including kayaks, surf skis, rowboats, dragonboats or stand up paddle boards and is open to all ages and abilities.